A lovely high standard fully furnish 4 bedroom house for rent at Bijilo. 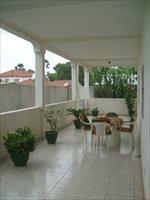 The property is very close to several hotels, supermarkets and the Atlantic ocean with lovely beach. It is fully fenced all round with cement blocks at the entrance of the house, flower garden, drive way, open garage and a variety of fruit trees. The Whole house is tiled and could be used as an office and/or for dwelling. All electrification, plumbing and telephone wiring completed. master bedrooms with showers & bathtubs, bathroom and wash hand basin. kitchen with store, sink and kitchen cupboards/units. Air-conditioners & Ceiling fans in all rooms & in sitting room.